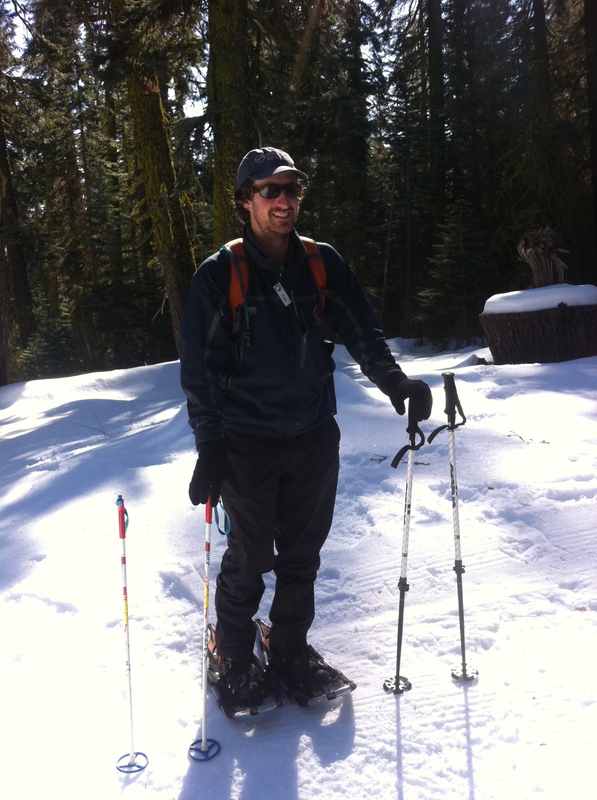 Event Recap: Yosemite Snowshoe Hike! I can’t believe it’s been more than a week since returning from my TNT Yosemite event weekend, and this is the first chance I’ve had a minute to sit down and recap it. I have to do it today before the memories completely fade! I have to say that this experience with TNT was completely unique from all of my other seasons. Instead of facing the Big Weekend with some degree of anxiety, dread, fear and adrenaline, I went into this one thrilled to be going on what felt like a weekend vacation. 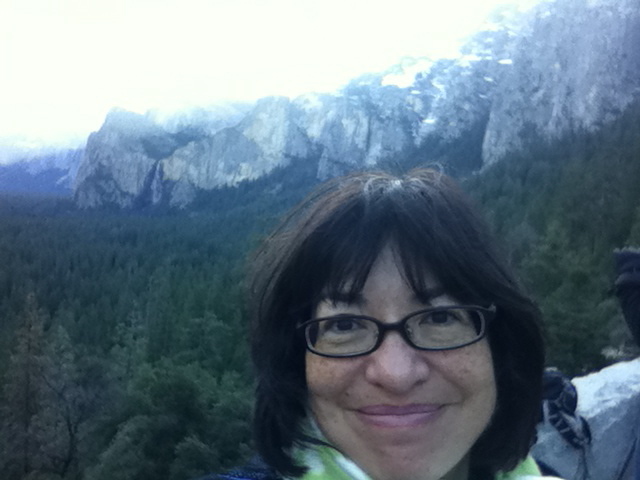 In beautiful Yosemite! Yay! At sort of the last minute, Junior and her housemate F joined me for the weekend. Junior hadn’t been to Yosemite since she was about eight years old and she was very excited. 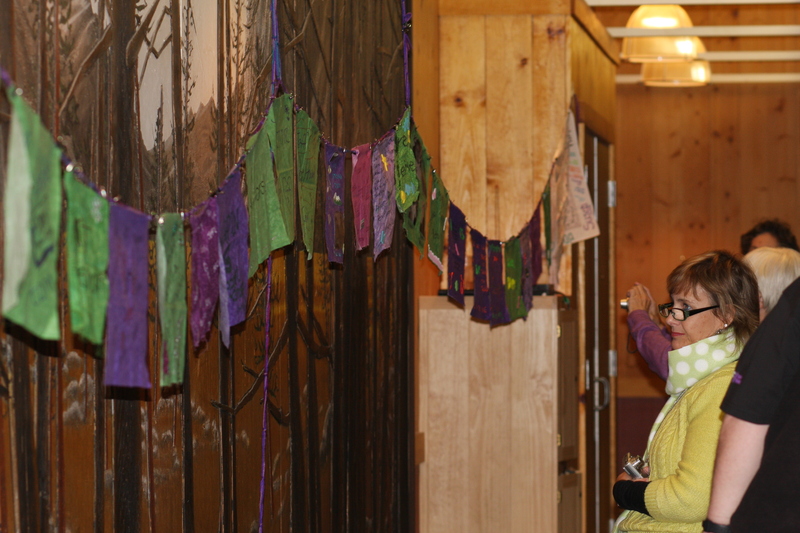 We arrived just in time to get to the snowshoe fitting and then the Send-Off (pre-event) dinner. The mood at the dinner was festive and relaxed. People had made flags with their honorees’ names on them and they were draped along the wall, a good reminder of Why We Were Doing This. 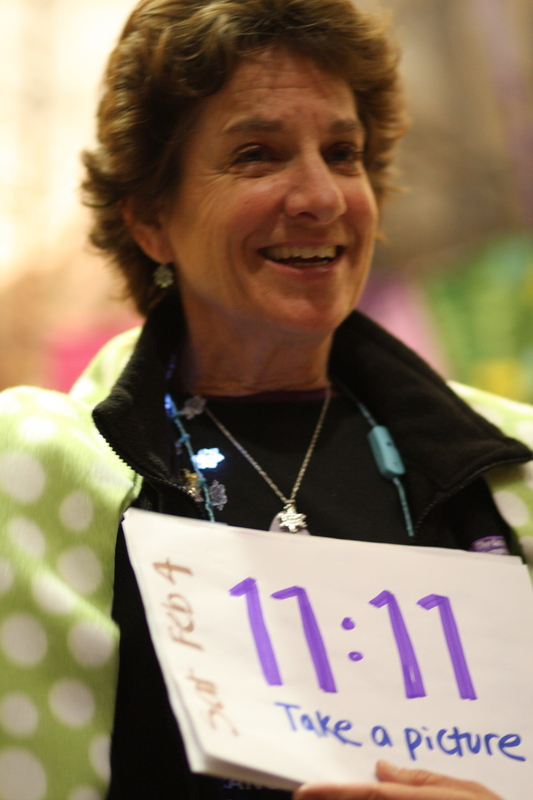 "Take a picture at 11:11 wherever you are"
Coach Carolyn gave us our instructions for meeting up, carpooling to the SNOW at Badger Pass, meeting up with our respective guides, and taking a picture at 11:11. We were divided into four groups based on exertion level. I was in the “Mighty Mo” or ‘moderate’ group which would later prove to be not-so-moderate, but still just right. I had just done that Tinkerbell Half, and was about to re-enter triathlon training, so I didn’t need to prove anything at this hike. 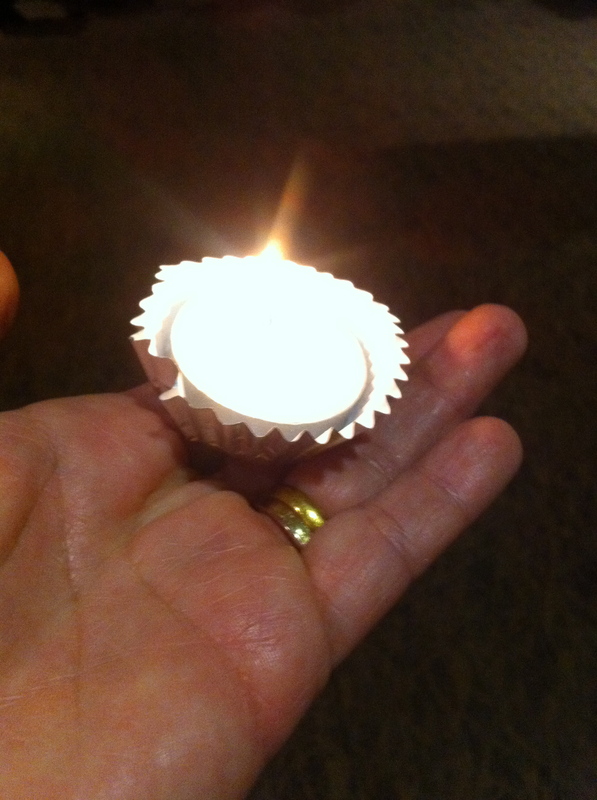 We did a little candle lighting ceremony and then blew them out as a symbolic gesture to “snuff out cancer.” We were thinking about one of our honorees, my mentor’s husband, who had been planning to come to Yosemite, but was in the hospital back home following some complications. 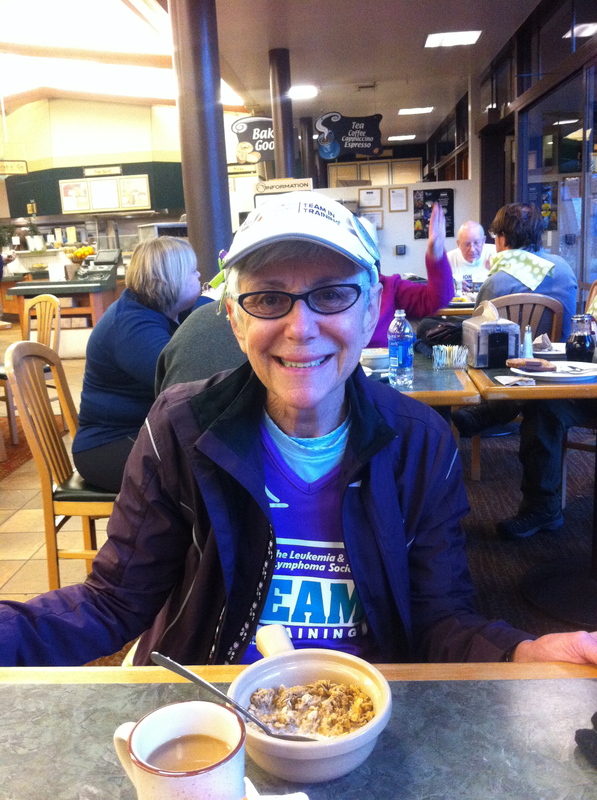 It was a reminder of Coach Carolyn’s words about life not always going as planned. 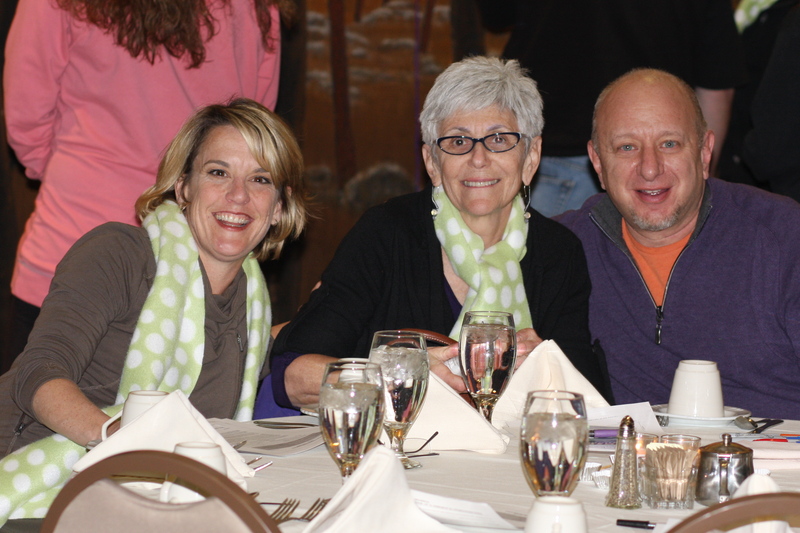 Randy had grappled with deciding to come to the event weekend, but the doctors had reassured her that her husband would be safe and cared for in the hospital. This lady has been through so much. After breakfast we drove out to Badger Pass. Yosemite is so breathtakingly gorgeous, pictures can never really do it justice. We got up to Badger Pass and there was SNOW! 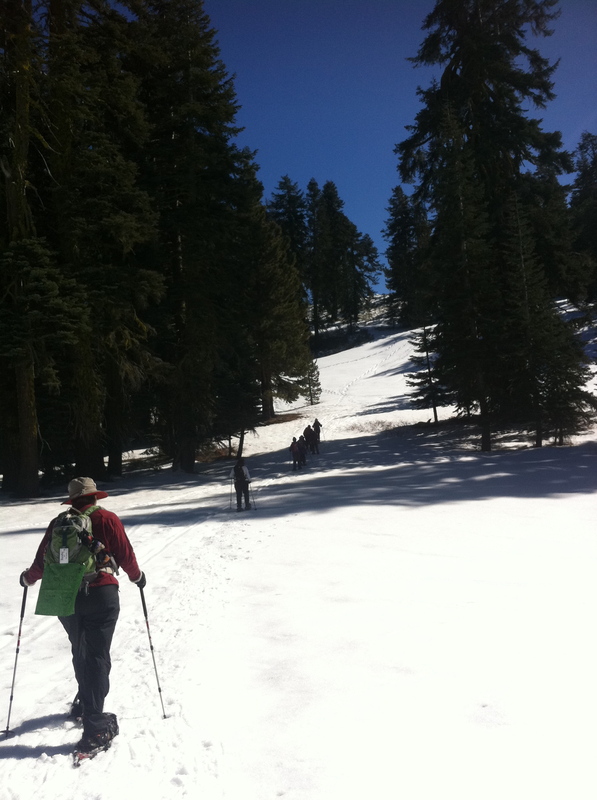 We put on our snowshoes… which took about half an hour of grunting, moaning and dealing with buckles and such. Finally… ta da! Then we split up into our respective groups and headed out with our guide. UPHILL. 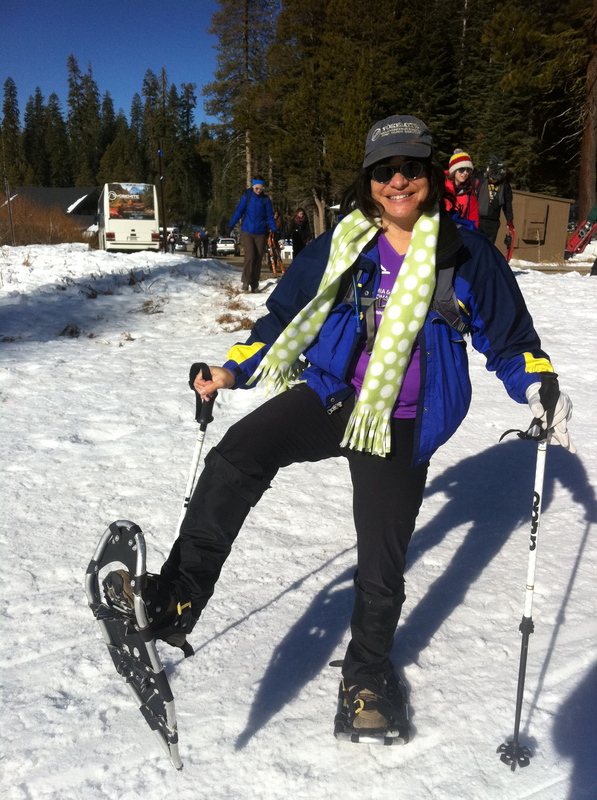 Going uphill on snowshoes at 7,000 feet elevation is… well, it’s no walk in the park. I was winded after about twenty yards. It was also pretty darn cold, in spite of the sunny weather. 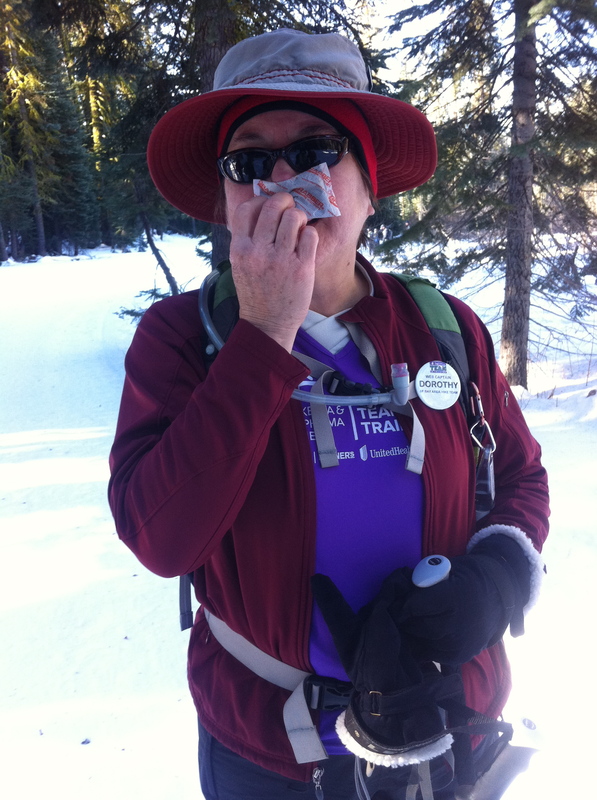 Here’s teammate Dorothy holding a hand warmer packet up to her frozen nose. Nose warmer? 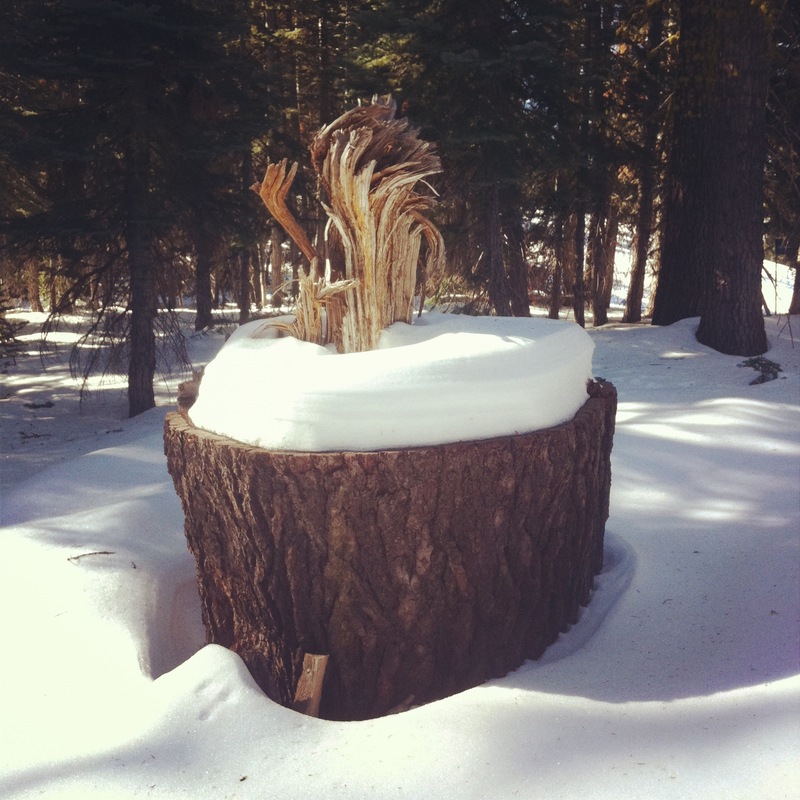 At 11:11am we found ourselves near what looked like a giant flaming snow cupcake. You see how my mind works. Here’s our trusty guide Zach, who was infinitely patient with our sometimes high-maintenance (ahem) group of women. We got to the top of the ridge and had us a nice lunch break on the sunny rocks. This is not something you get during marathons and triathlons! It was so pristine and beautiful up there! On the way back down, we separated out to do solo meditations for a few minutes. 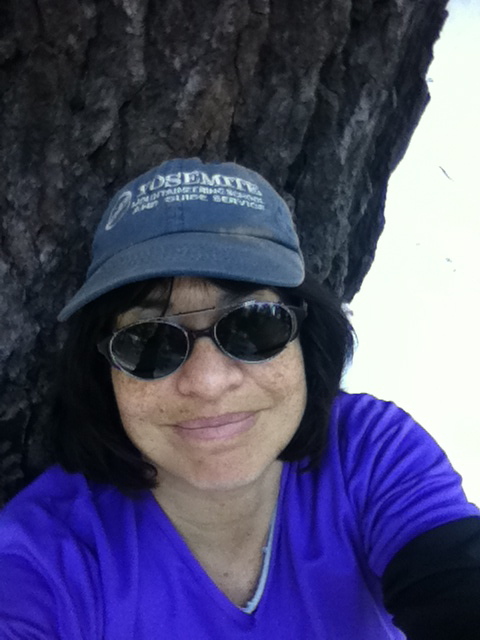 I found a tree to lean on and just soak up the peace and quiet for a while. It was one of my favorite parts of the whole hike. 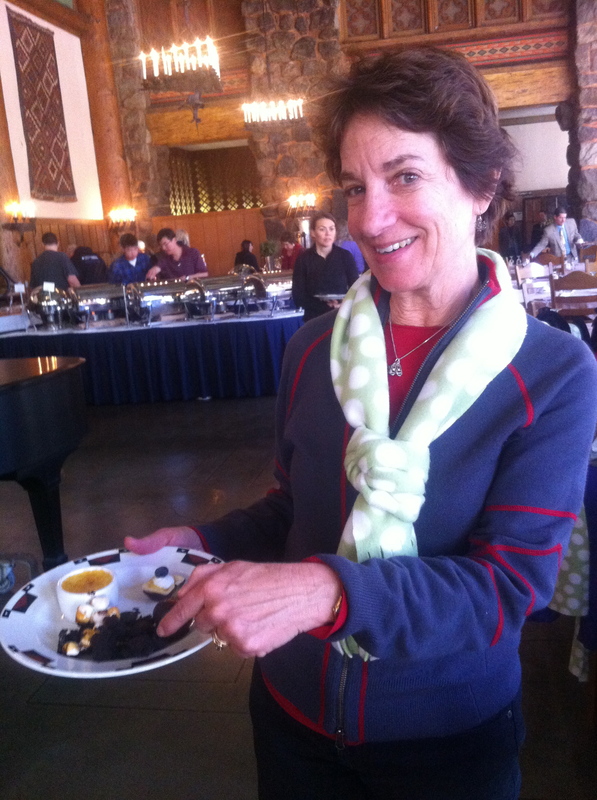 We got back down to the lodge after about five and a half hours of snowshoeing. Which felt “just right” in terms of a damn good workout, a beautiful hike, but not horribly painful. I had gotten a good day’s work in there. When we arrived down to the Valley we got the sad news that Randy’s husband had been transferred to the ICU and was in very grave condition. My buddy Jon volunteered to drive her down to the hospital, over 4 hours away, so she could be with him right away. This is what team spirit and our mission is about. 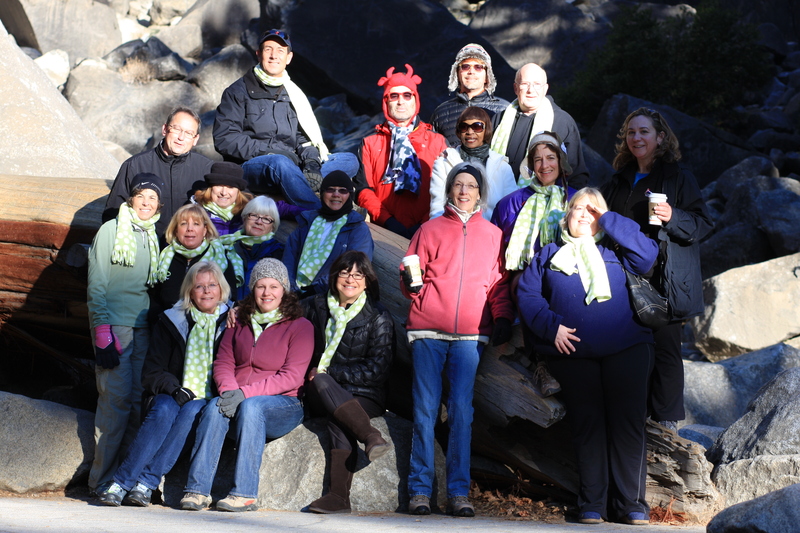 The rest of us celebrated the end of our season and our hikes, thinking of them and sharing a moment of silence. 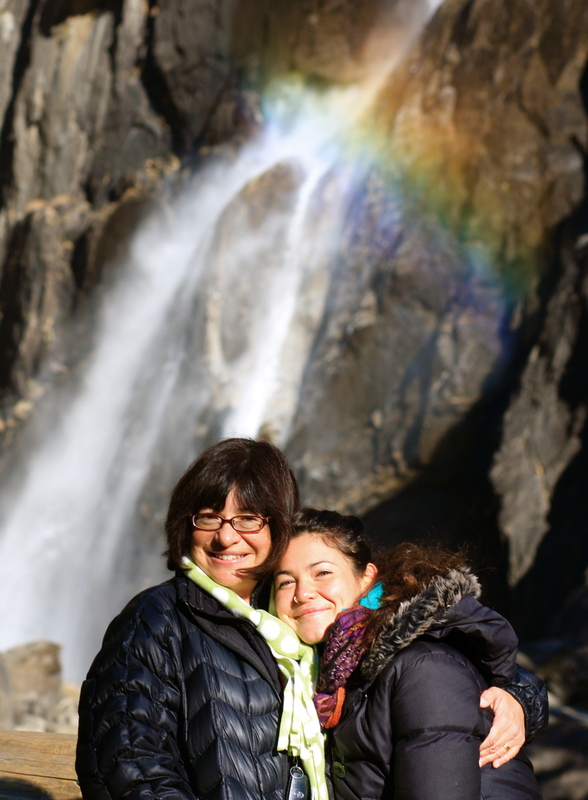 The next morning we walked up to the beautiful Yosemite falls for some photo ops. 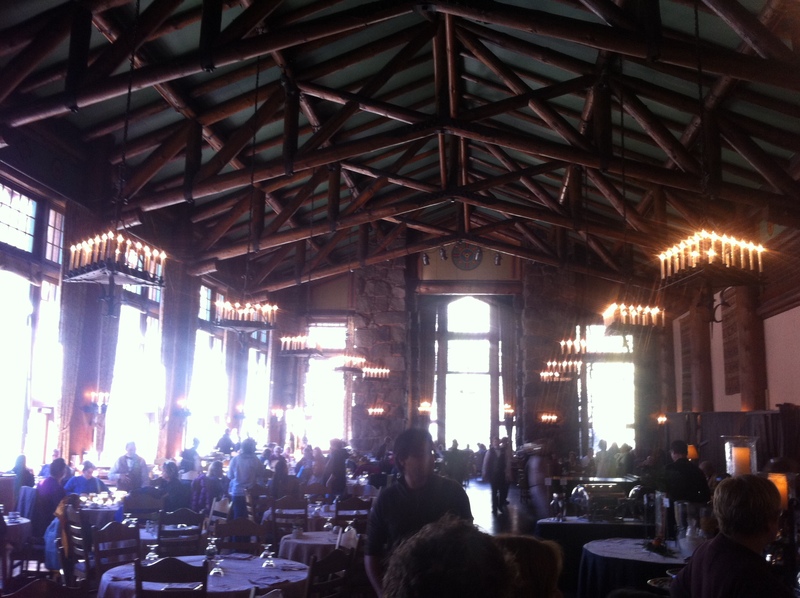 Then it was the amazing Ahwahnee Hotel for their insanely delicious brunch. What a way to wrap it all up. 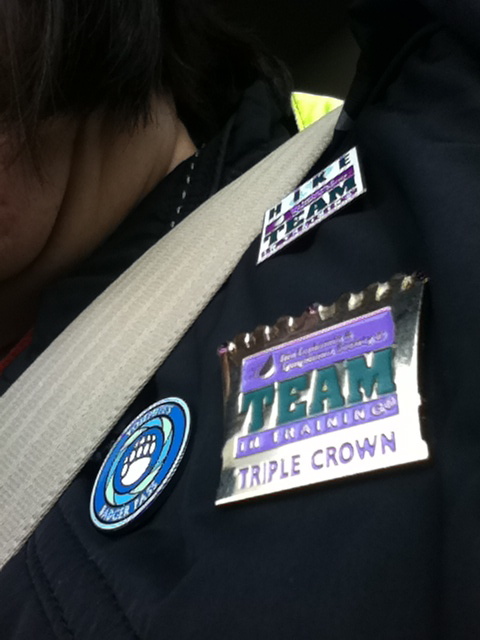 With this event, I earned my Team in Training Triple Crown pin for participating in three different sports: marathon, triathlon and hike team. It felt good. Badger Pass, Hike Team, Triple Crown! Hike Team was very very different from other “endurance” events but it was a welcome change of pace and something I’d definitely do again at some point. 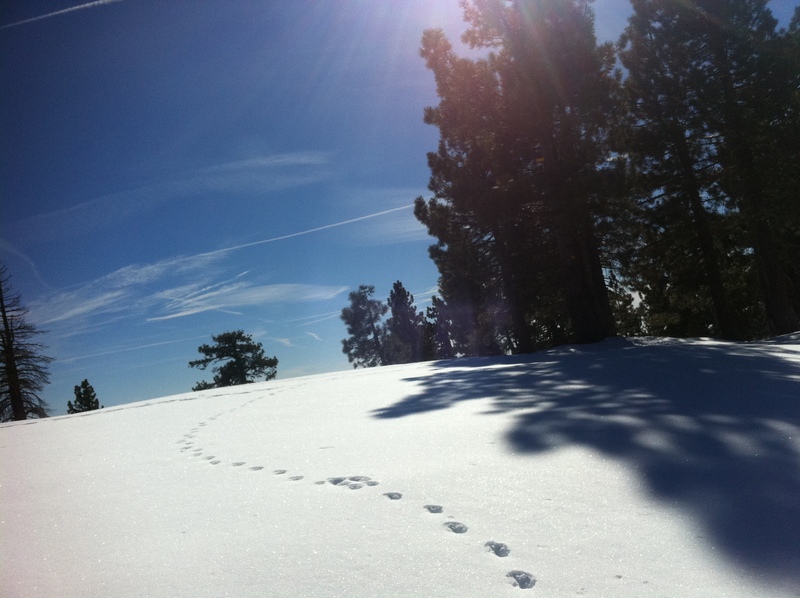 They have incredible hikes to the Grand Canyon and other stunning locales. 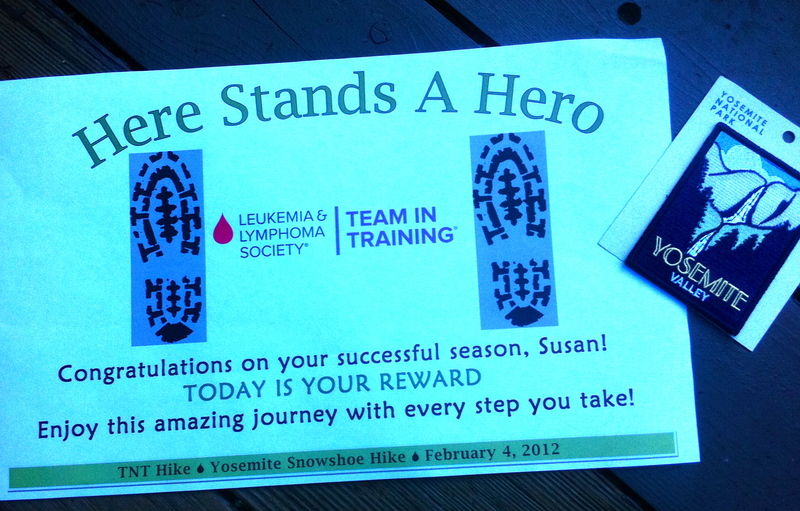 In final news, I’m almost….. almost… almost... done with my fundraising. But not quite. If you’ve enjoyed reading about this very unique and different type of training, please consider dropping a few dollars into my Leukemia & Lymphoma fund. I’d be so very grateful. All in all, it was a beautiful, active, inspiring experience. I recommend for anyone who is interested in being part of an active team that’s working for a good cause. Thumbs up.